A visit to the Mangapps Farm Railway Museum in Burnham-on-Crouch provided an opportunity to capture a selection of signal box diagrams. Signal box diagram for Northwich Central as seen at Mangapps Farm Railway Museum. The diagram is orientated east (left) to west (right) with the line from Sandbach coming in at the bottom left hand corner where it joins the line from Chester and Mouldsworth at Sandbach Junction. The line heading south is L&NWR property and opened in 1867. It is sill open today for freight and excursion trains, such as the Topper Chopper. The line from Chester open two years later in 1869. In 1957 BR constructed a south-to-west chord. The track disappearing off the bottom right edge lead to Bowman's Works, whilst the main line heads east towards Lostock (on the diagram) which was originally named Lostock Gralam. The line subsequently swings north towards at Altrincham. The modern day view is provided courtesy of Google Streetview - using the image rotating tool to see the modern day station and the 'LNWR loop' heading eastwards behind the station. 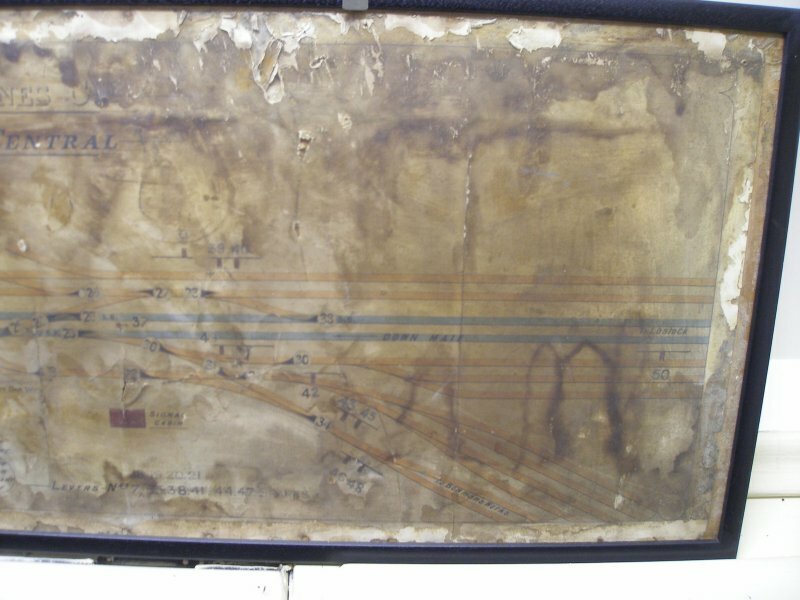 GER Chippenhan Junction Signal Box diagram as seen at Mangapps Farm Railway Museum. Chippenham Junction is located to the north of Newmarket and formed one side of a triangular Junction, formed of Snailwell Junction to the west and Warren Hill Junction to the south. It opened in 1879 with the opening of the Ely & Newmarket Railway. Sadly the Snailwell Junction - Warren Hill Junction chord is now closed. GER Cold Norton Signal Box diagram as seen at Mangapps Farm Railway Museum. Cold Norton was on the line from Woodham Ferrers to Malden. The line opened in 1889 and closed in 1953, although Cold Norton closed earlier, in 1939. The wide open space in the middle distance, and the bridge brickwork in the foreground are the clues in this screengrab from Google Streetview of the station's location. Cuckoo Junction Signal Box diagram as seen at Mangapps Farm Railway Museum. The junction was on the outskirts of Spalding, and allowed access from the east-to-west Midland & Eastern Railway to the north-to-south Great Northern and gave direct access to Spalding Station. The chord was opened in 1866 and closed in 1965, along with the Midland & Eastern. The junction at the other end of the chord was South Junction. Locating the junction on Google Earth was surprisingly difficult, although the warehouse-type structure to the left of the road is on the site of 'Cuckoo Junction Farm'. Haddiscoe Signal Box diagram as seen at Mangapps Farm Railway Museum. Haddiscoe Junction was on the Reedham to Lowestoft line, and allowed a direct connection to the East Suffolk line to Beccles, and both the East Suffolk and the junction closed in 1965. Google Streetview shows that the main line is alive and well, and the station carpark reflects good usage. The platform shelters can be seen through the bushes to the left. M&GN Hillington Signal Box diagram as seen at Mangapps Farm Railway Museum. The Midland and Great Northern Railway was a joint cross-country line connecting the East Midlands with the Norfolk coast, and saw a heavy summer time traffic. However, its low winter traffic level saw it closed in 1959, some years before the Beeching Report closures. Although the station closed in 1959, freight continued to pass through to East Rudham from South Lynn until 1968. To the west was Grimston Road, and to the east was Massingham, the diagram being orientated east-to-west. Two modern houses sit on the trackbed in Station Road here. 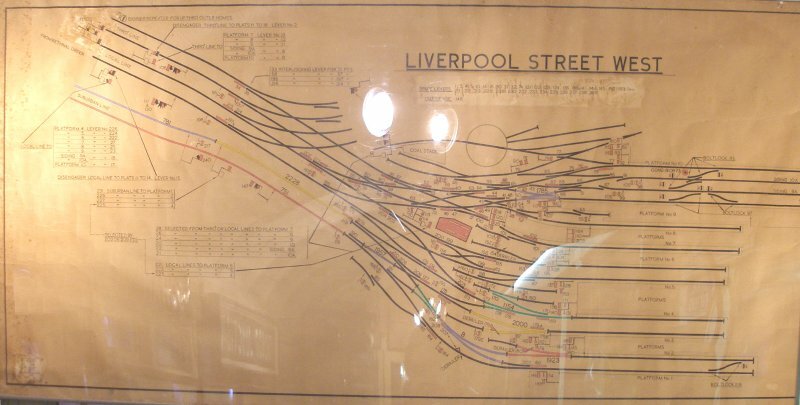 Liverpool Street West Signal Box diagram as seen at Mangapps Farm Railway Museum. This diagram shows the western side of Liverpool Street Station in London. From the low numbered platforms trains departed to Enfield Town and the Southbury Loop. At one time the tracks through Platforms 1 & 2 extended through the concourse and through the back of the station to meet the Metropolitan Railway. M&GN Paston Crossing Signal Box diagram as seen at Mangapps Farm Railway Museum. Located just outside Peterborough, Paston Level Crossing closed in 1961, having opened in 1866. The line beyond Dogsthorpe closed slightly later, in 1966 when freight from the sidings ceased. The line ran from Peterborough to Murrow and Wisbeach. Access to Dogsthorpe was maintained in 1961 when BR constructed a chord at Murrow which connected it to the Great Northern and Great Eastern Joint from March, which in turn closed in 1982. The rail alignment has now been utilised for the new A47 road alignment and Paston Crossing is now the site of a multi-level road junction which can be viewed here. 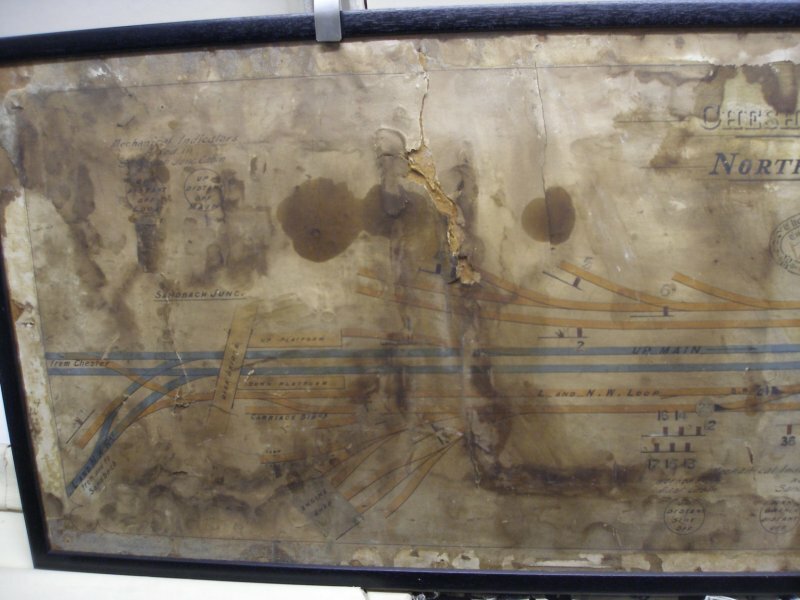 Pinchbeck Signal Box diagram as seen at Mangapps Farm Railway Museum. Pinchbeck is on the Spalding to Sleaford line; the line opening in 1882 but the station closing in 1961. The level crossing which can just be seen faintly to the left of the platforms has been replaced in recent times with a road overbridge. Romford Junction Signal Box diagram as seen at Mangapps Farm Railway Museum. The branch to Upminster left the mainline here, and the site can be viewed from a handy footbridge, the access patch can be seen here. 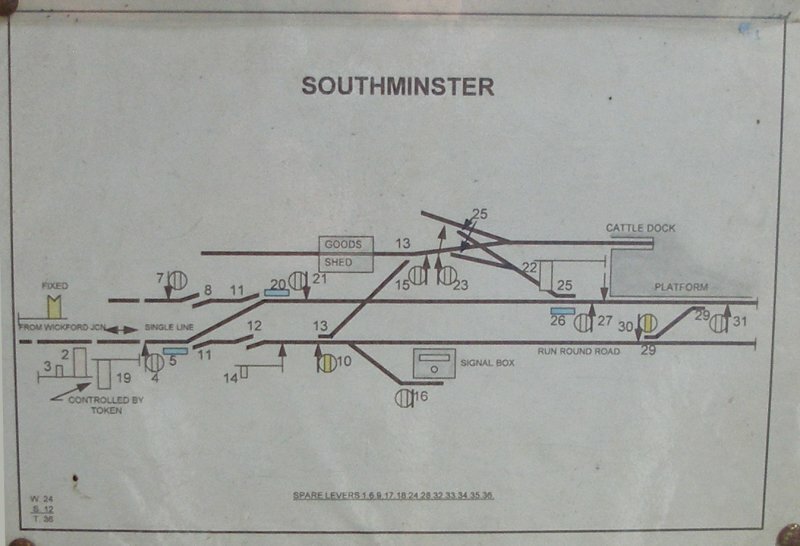 Southminster Signal Box diagram as seen at Mangapps Farm Railway Museum. Southminster Signal Box panel as seen at Mangapps Farm Railway Museum. The branch is alive and well, and electrified. Trowse Upper Signal Box diagram as seen at Mangapps Farm Railway Museum. The junction marked the point that the original line to Norwich Victoria (1849) left the later spur to Trowse and Norwich Thorpe (1851). The road passes under the railway at this point but the location can be viewed here. Wickford Yard Signal Box diagram as seen at Mangapps Farm Railway Museum. The yard may now be the station car park but station is alive and well, as can be seen here. 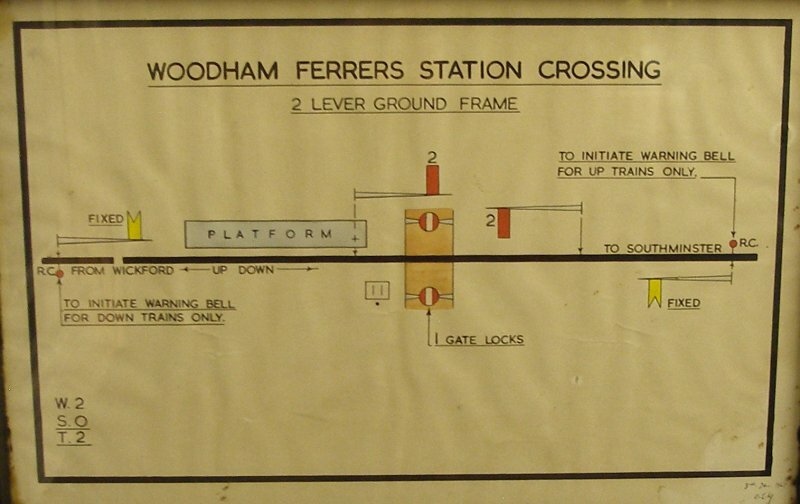 Woodham Ferrers Station Crossing diagram as seen at Mangapps Farm Railway Museum. The branch from Wickford to Southminster opened in 1889, and is still open today. This is a relatively modern diagram as there is no indication of the junction for Maldon, which closed in 1953. Langley Green Signal Box diagram as seen at Mangapps Farm Railway Museum. This West Midlands location is on the Great Western's Stourbridge Branch, which carried traffic from Snow Hill via Handsworth Junction to Stourbridge Junction, which opened in 1867, and is still open today. Langley Green was the junction for the relatively short branch to Oldbury which opened in 1884 and closed in 1964.